I’ve never been all that good with tools. I guess it’s not that I can’t use them – it’s just that I don’t particularly enjoy using them. So that means I’m fine with not being good at using them. But I’m still capable of getting projects done around the house. Since moving into my own home for the first time about 18 months ago, my list of accomplishments, along with my tool collection, has grown considerably (and Menards is in possession of a respectable chunk of my change at this point). I guess the things I like building are a little more intangible than an attractive backyard fence or a deluxe cedar rocking chair with cup holders. So, with an awareness of this general aversion to tools, you can imagine what my wife thought when I told her that a couple of guys from Volume One and I were going to build – completely on our own – an entire store in the front part of our office. We needed to totally transform more than 600 square feet of our office with a system of shelving, a stud wall, paint, lighting, some custom displays, and a counter – no wait – a very complex, multi-angled, multi-height counter wrapped around a giant, immovable support post. And we had just a few weeks to do it AND keep doing our normal jobs. No contractors, no interior designers, no consultants. It’s not that we couldn’t have used their help – there just wasn’t any time if we wanted to get this store open by the holiday shopping season. So individuals from the Volume One team who normally work on graphic design, editorial, and advertising all pulled together to actually design, build, and lay out everything on our own (with just a bit of help from IKEA). So now it’s done, and frankly, I think we pulled it off quite nicely. With that, we introduce to you The Local Store at the Volume One World Headquarters. 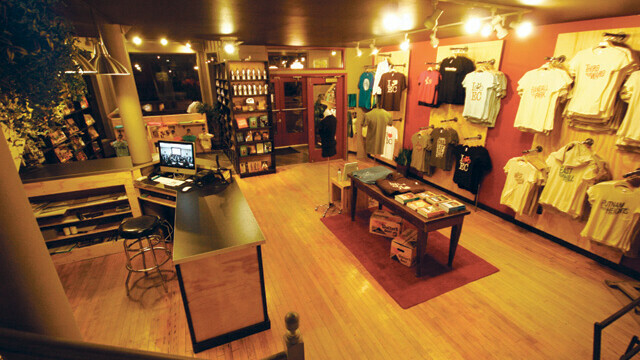 Our home at 17 S. Barstow Street now displays apparel, books, music, art, and more – all with a local focus. The products available are all designed, made, or otherwise dreamed up by the people of this community. Or, the products somehow evoke a sense of place in the Chippewa Valley or Wisconsin in general.